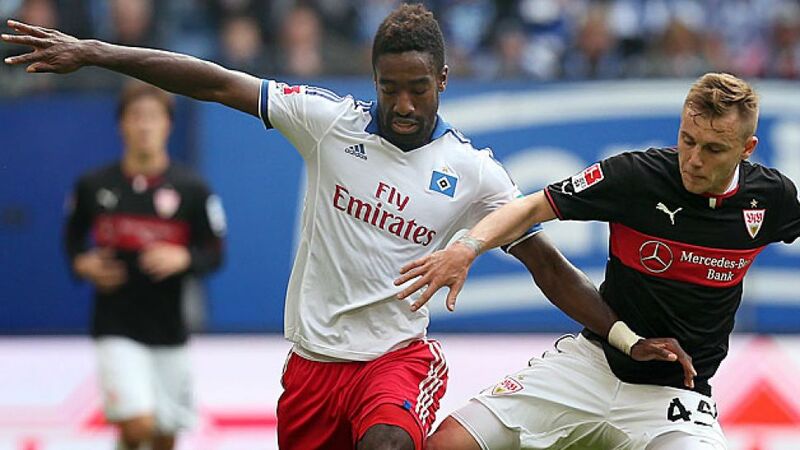 Hamburg - It was a day to forget for Johan Djourou. Not only because Hamburger SV’s defensive general had to stomach conceding three goals against VfB Stuttgart, but also because he had a direct hand in one of them, converting an own goal to make it 3-2 to the guests. In the end, Hamburg were able to claw back a 3-3 draw to give the fans some cheer on Bert van Marwijk’s home debut. The Dutch coach has now led three games and is unbeaten with Djourou noticing a clear improvement. "The whole team’s tactics have changed," he said. "We’re looking far stronger on the field and are more of a unit, but we can certainly do some things a lot better." Find out what else the former Hannover 96 stopper had to say in an exclusive bundesliga.com interview. bundesliga.com: Mr. Djourou, when HSV are playing, then goals are a certainty. This time it was a 3-3. What do you say about these exciting 90 minutes? Djourou: It was a crazy game. It was very hard for us because we fell behind three times, and the goals we conceded were far too soft too, and that’s without mentioning my own goal. But we showed character as a team and fought back each time, and we’ve got to take that out of the game with us. bundesliga.com: So does that mean a draw was a fair result? Djourou: Yes, I think so. We started the game a bit cautiously and things were going to and fro for a while. Even if we maybe had more of the chances, the draw is certainly a fair result. bundesliga.com: The 0-1 against Stuttgart was already the third goal you have conceded inside the first five minutes. Against Schalke, the opening goal fell in the second minute and against Hoffenheim, it was in the fifth. Are you lacking the necessary concentration at the start of games? Djourou: It certainly looks that way, but in both those games, we were behind for a while. Fortunately against Stuttgart, we scored early on because it’s always hard for a team to have to chase a game. But we fought well. bundesliga.com:Pierre-Michel Lasogga is on a roll at the moment. Was he the missing piece to complete the HSV puzzle? Djourou: He’s made a great start here and long may it continue. He’s physically a very strong striker, both in the air and with the ball on the ground. bundesliga.com: What’s changed under Bert van Marwijk as coach? Djourou: The whole team’s tactics have changed. We’re looking far stronger on the field and are more of a unit, but we can certainly do some things a lot better and we’ve got to work hard on this. Djourou: We had a big chance against Stuttgart to climb a fair way up the table, but unfortunately we didn’t take it. But we can do better on Saturday. Every game in the Bundesliga is a really tough one, but we want to win them all and that is the aim we take with us to Freiburg. bundesliga.com: This is your second season in the Bundesliga. How are you finding your second year? Djourou: It’s amazing. The Bundesliga's a fantastic league and you face a major challenge every weekend. It’s not easy, but I'm loving it. Djourou is impressed with how quickly Pierre-Michel Lasogga has settled in at HSV. With goals like this, taken from bundesliga.com's official Bundesliga YouTube channel, can you argue with him?